For a complete, treat yourself experience, there’s nothing more exquisite than an afternoon spent at the Mandarin Barber at Mandarin Oriental. Regarded as Hong Kong’s finest grooming salon for gentlemen since 1963, you’ll be welcomed by interiors imagined from the Art Deco Chic of 1930s Shanghai. Enjoy your shave, moustache trim, beard design or the classic Mandarin shave in absolute peace and quiet by requesting a VIP room. If you have 160 minutes to spare, try their Gentleman’s Grooming package where you’ll be pampered with a shampoo and cut, Mandarin shave and Shanghainese pedicure. This luxurious barber was founded in London’s upscale Mayfair district in 2004 and was on the frontlines of men’s grooming in Hong Kong back in 2011. While you’re there for a trim or shave, why not add on a massage and facial as well? Their Shackleton package includes a haircut and a choice of a beard trim or wet shave. The Hemingway package, designed for “After a Heavy Night Of Drinking and Bull Fighting”, is perfect if you’re in need for a quick hangover cure. Sip on your complimentary Bloody Mary and melt into the aromatherapy facial and a neck, scalp and shoulder massage. Located on Pottinger Street, this rustic Hong Kong barber shop was formerly known as Era Barbers. 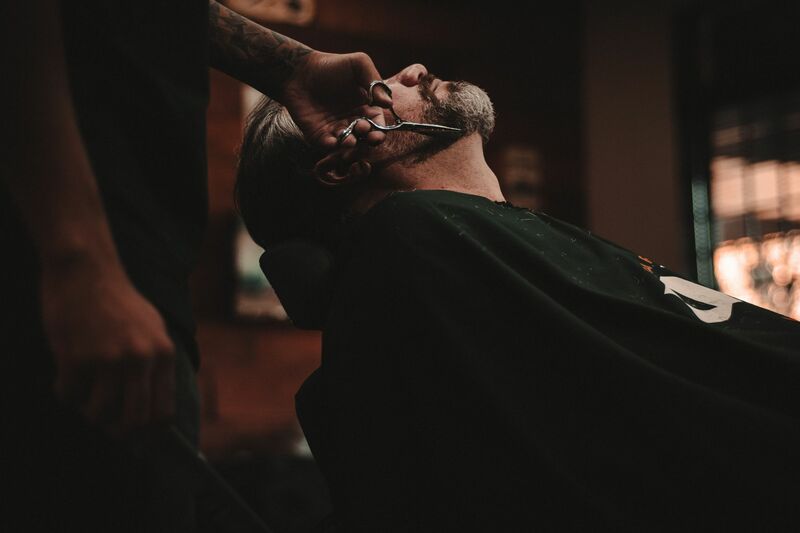 With its new name, Selvedge Barbers, they remain a proud partner of Movember each year, offering complimentary, once-a-week cuts for those who post a weekly progress photo. From buzz cuts to skin fades and wet shaves, Selvedge Barbers does it all. Located in Pacific Place, Saloon is the newest addition to the grooming scene. The deep wooden hues and leather seats resemble a secret whisky bar—there’s even a shelf full of whisky to prove it, not to mention the glass you’ll be offered during the consultation. The shop offers everything from hair treatments, colours and cuts to beard trims and wet shaves. Been walking all day? They have foot treatments and massages too. Private rooms are available upon request without extra charge. Bespoke tailoring and grooming boutique Attire House collaborated with skilled Korean barber, HERR, to open their in-house barbershop where you’ll be able to jump from shopping to grooming. Providing haircuts, wet shaves and facial massages from barbers staffed by Seoul veteran Roy Jeong, invite your friends to lounge at the Cigar Room afterwards to enjoy their carefully chosen Cuban cigars. This highly rated barber shop has grown a loyal following over the years. Opened by former hairdresser Adam Chan, Hair House brings back the soul of Shanghainese barber stores, treating every customer like family. Simplicity at its best—with only a straight razor and a hot towel for their classic wet shave—you’ll leave looking and feeling fresh. Fox & The Barber’s white tiles and nostalgic 1940s lighting is as classy as it looks. Owner and barber Sarah McGlynn pays close attention to detail and makes sure everyone leaves with a smile on their face. Using only the best products such as Penhaligon’s and Truefitt & Hill, the offer beard trimming, designing and shaping services as well as a good old shave. The Strand strives to be a hangout spot for guys to get away from the daily stress and chaos. Located by the Soho escalators, the salon takes up four floors of the space, with the entire second floor dedicated to men. Decked out in modern, black leather seats and sleek wide mirrors, you’ll go in looking for their signature shave and be tempted by the extensive spa menu. And why not? Try out their non-surgical face-lift to reverse the years or a comforting sleep massage to ease into the night. Described as a modern barber shop and a gentleman’s lounge, The Dukes offers beard shaping and trimming as well as clean, stylish haircuts. Stocked with cigars, darts, video games, this three-story man cave is perfect for father and son bonding time. Handsome Factory’s retro black and white checkered floors, black barber chairs and dark wooden accents will draw you into the shop, but it’s the quality cuts that will be making you stay. With three locations across Central, Causeway Bay and Tsim Sha Tsui, their menu is straightforward and covers only the essentials.